Very happy to finally get my hands on one of these, in good condition at a good second hand price! We have had a couple of trips in it now. 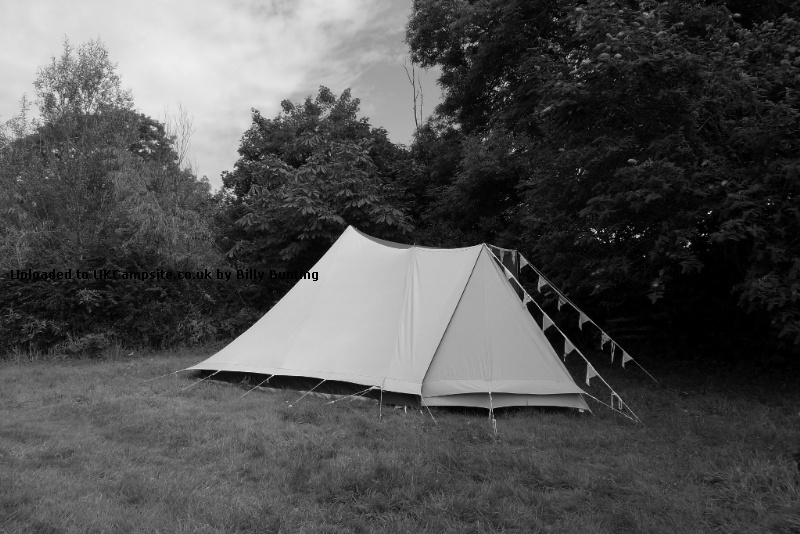 The climate in a cotton canvas tent is SO superior to man made fabric: breathable, warmer in the cool and comfy when (if!) it's hot. 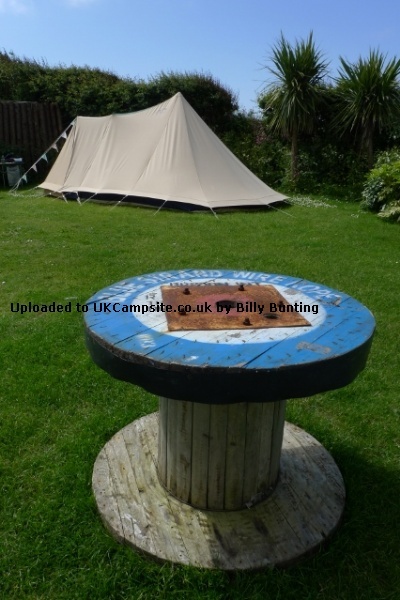 It is simple to put up, with a central pole, a door frame and two porch poles; simple enough for me to do it single handed. 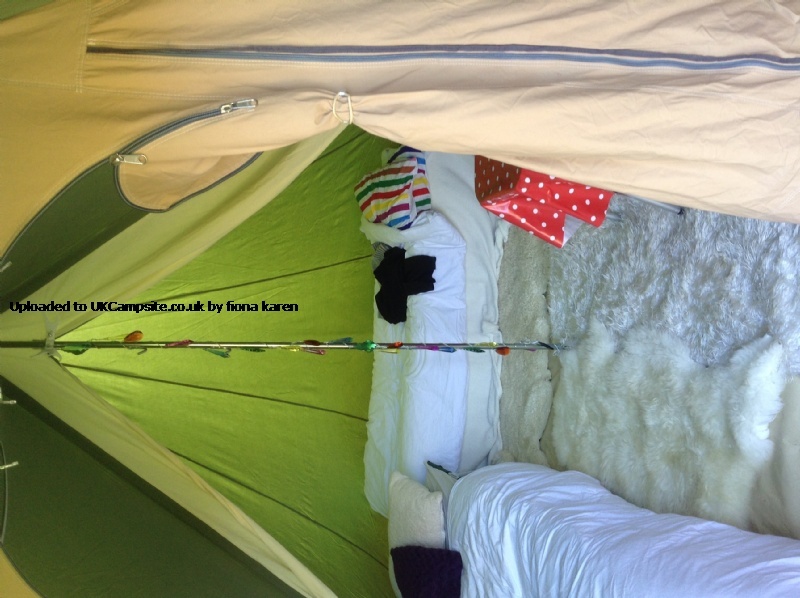 The lack of a separate bedroom inner is no issue at all, as there was little to no condensation build- up over night. 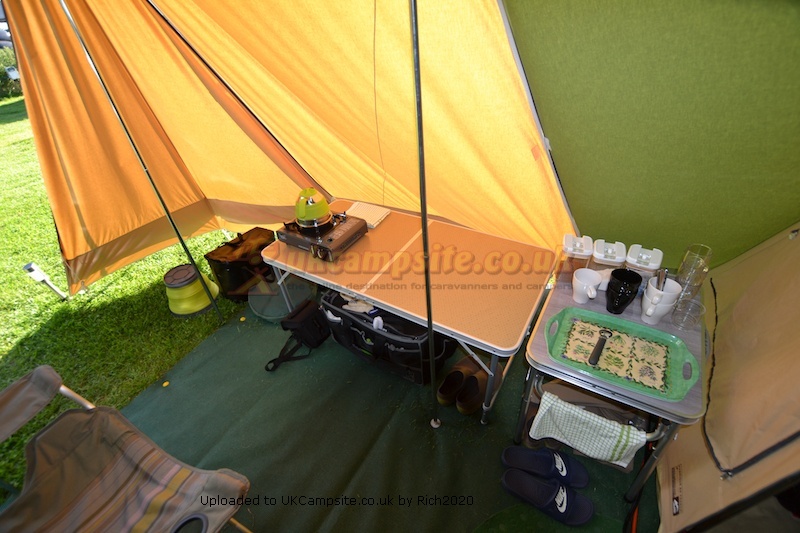 The porch area is wide enough to fit a kitchen table within the shelter, and also prevents rain ingress when the weather is bad. 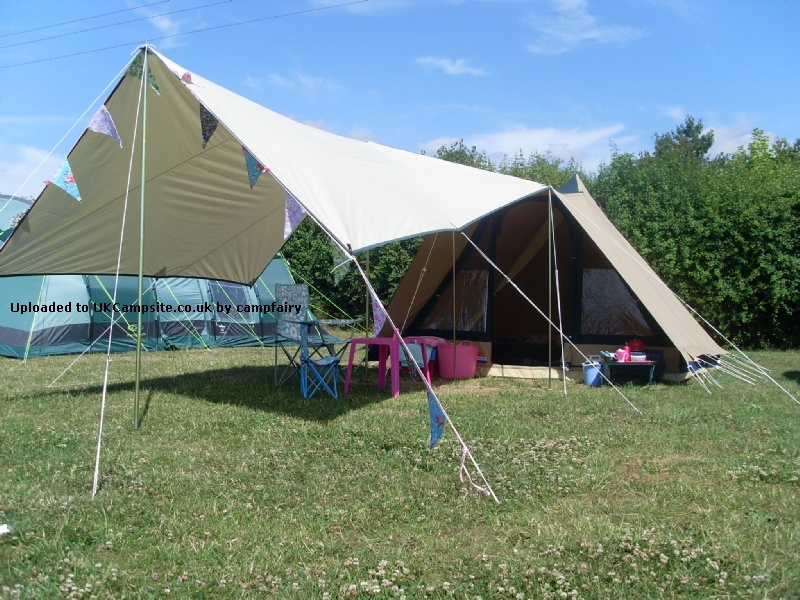 We intend to buy the sun- canopy to extend the outside sitting area further. The windows let in good light and have mesh ventilation too, with outside covers. The door zip is two way so it is possible to have the top part opened for air, or to open up the whole right side of the front wall. 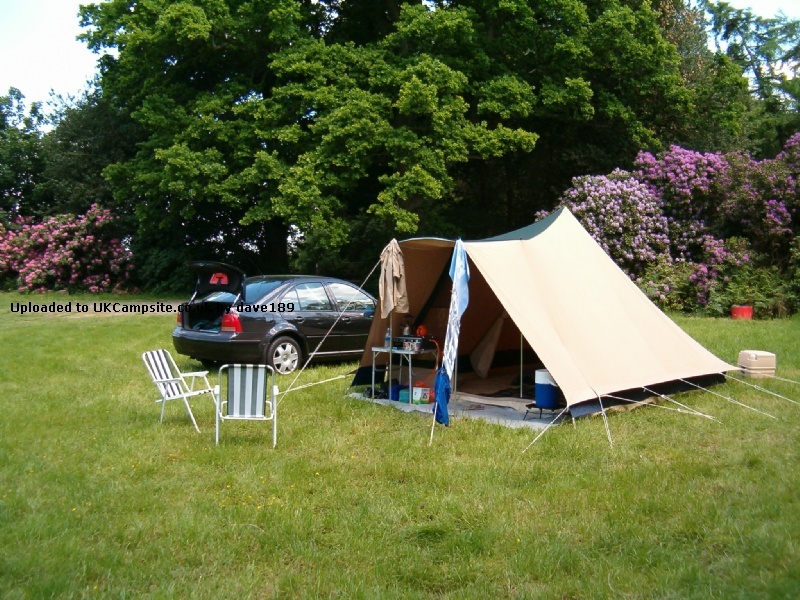 It packs in two bags making it manageable in and out of the car. It is supremely stable owing to the wind- shedding shape, and withstood a fierce rainstorm without a drop of rain coming in. 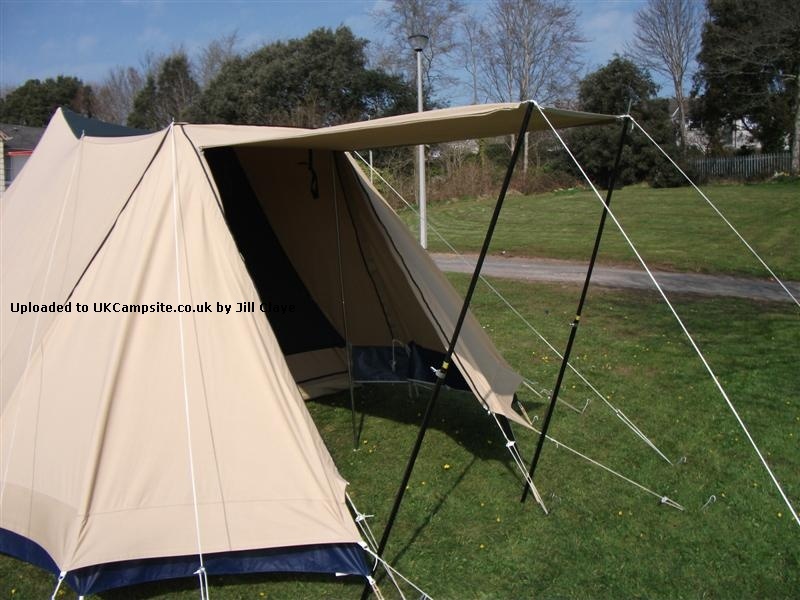 There is plenty for space for the two of us, and it is of superb build quality in terms of materials, stitching and finishing. 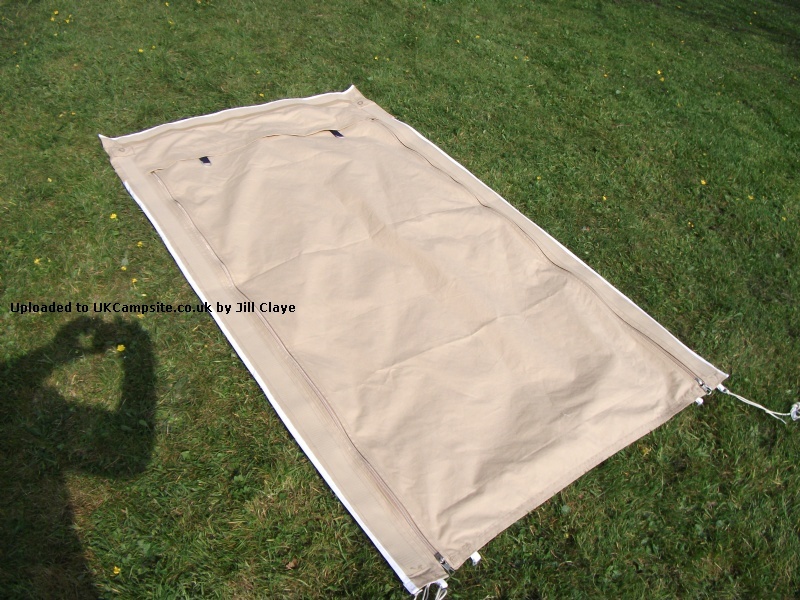 The SIG is heavy duty PVC, and we have cut our own lightweight footprint from a cheap tarp to keep the SIG clean. Secondary mozzie mesh on the door ( we are working on our own bespoke version for next summer!). 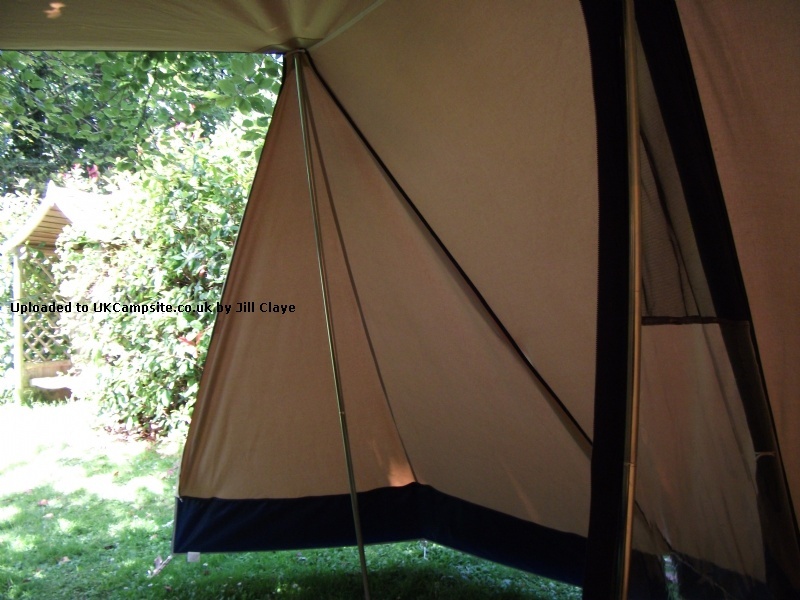 All in all, this tent is everything I hoped it would be, and has renewed my love of camping for many years to come. Worth every penny. 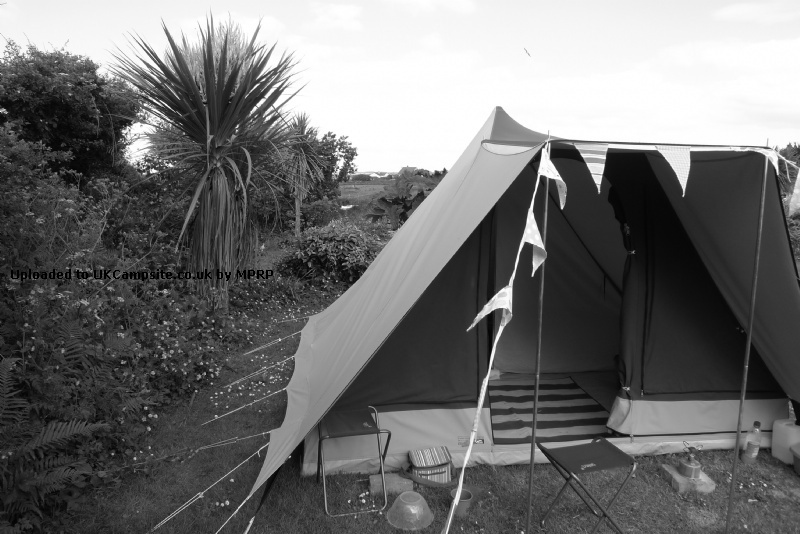 Just celebrated our tenth summer in this tent - used more times than we can count, and hardly showing its age. So simple to put up [and put away] - it is possible to do it single handed. And it is brilliant in bad weather: we have many times seen families struggle with lighter-weight tents in wind and rain, and the porch protects the doorway, so it can be left open during a storm: we have had six people comfortably sitting and eating a meal in the front part of the tent [ie, not the sleeping area] looking out at the rain. 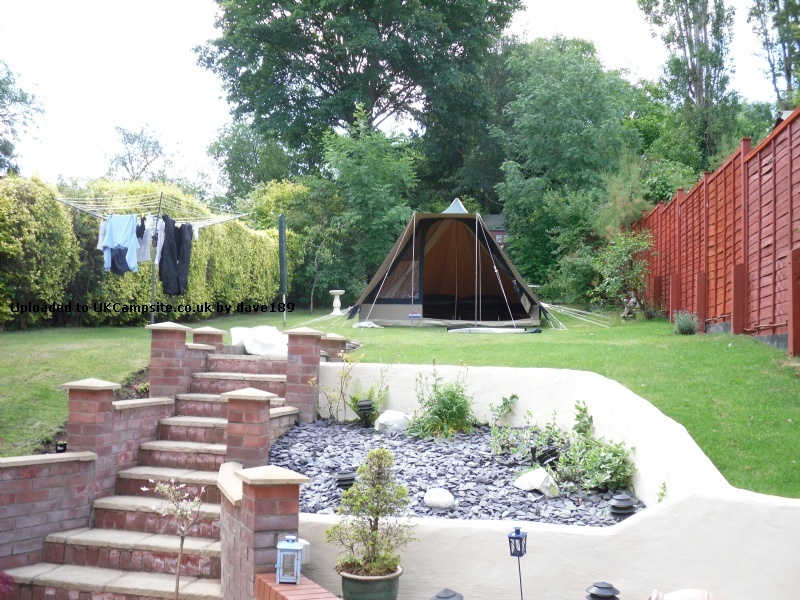 The sewn in ground sheet is also very good: no draughts, and no floods. 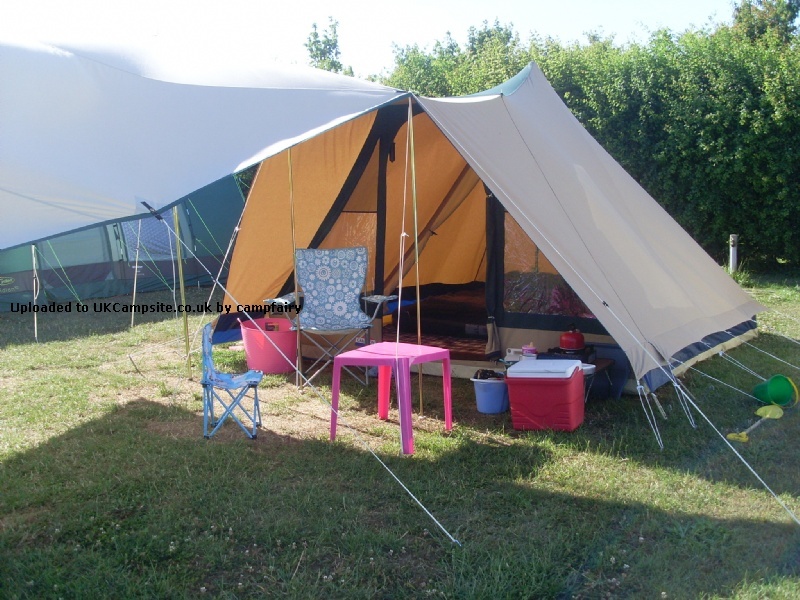 We cannot speak too highly of this tent. It is worth every penny. 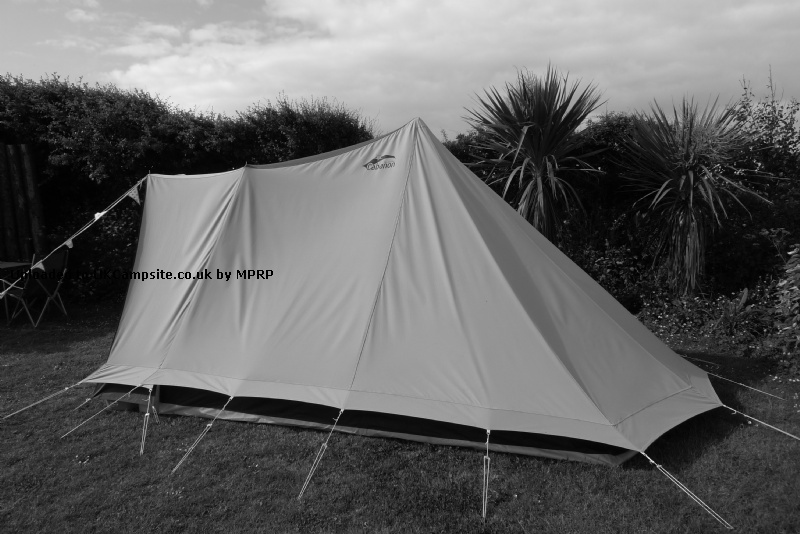 Just had our first trip away in the Guadeloupe, it feels much more solid to sleep in than the other poly tents that we have used. 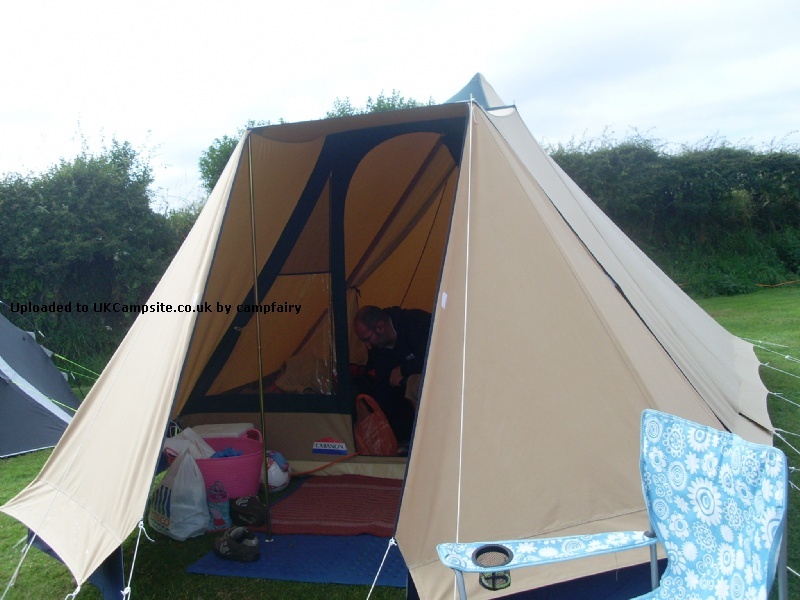 Good quality and surprisingly roomy. 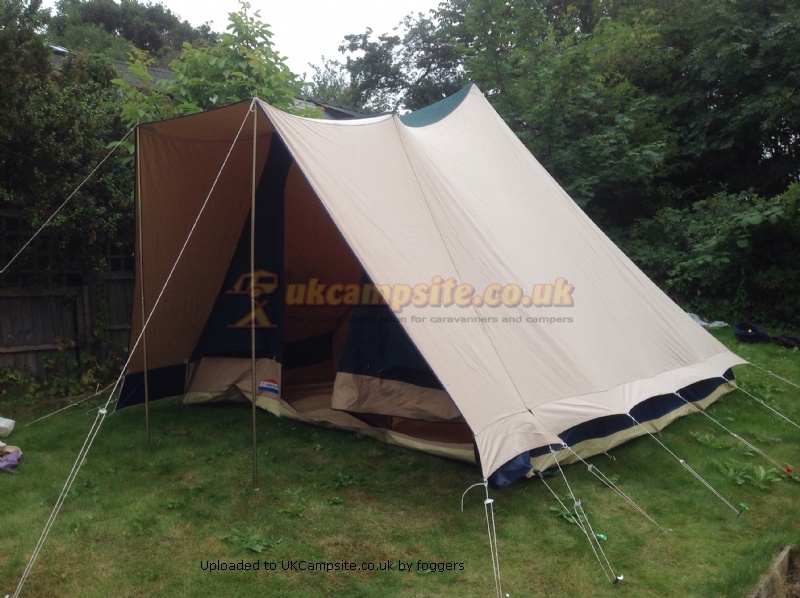 We have got it as we do lots of coastal camping and wanted something a bit more windproof. 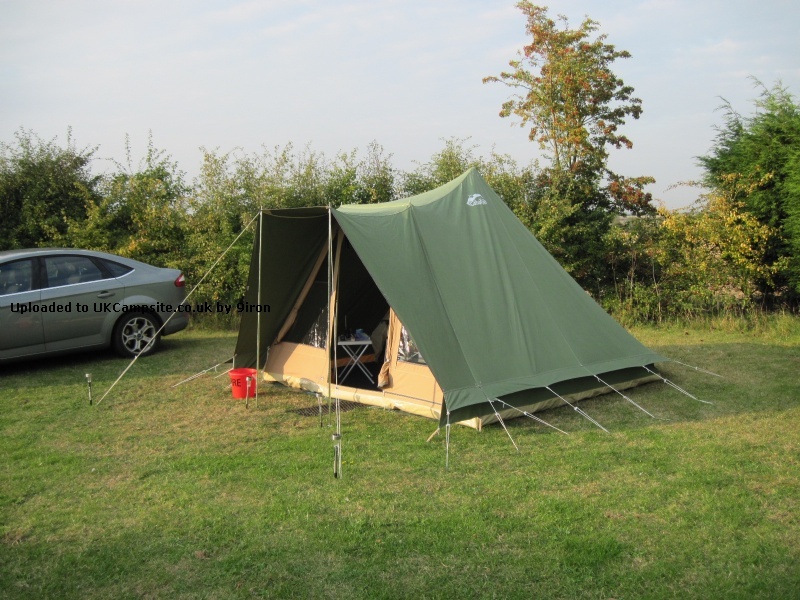 I am investigating whether its possible to add a big fly screen at the front so that we can leave the front open as the porch provides a big degree of protection to the front. Very happy with it, OH a little less so as he had to go round doing all the pegs which took a while! 0 from 1 people found this review helpful, was it helpful to you? 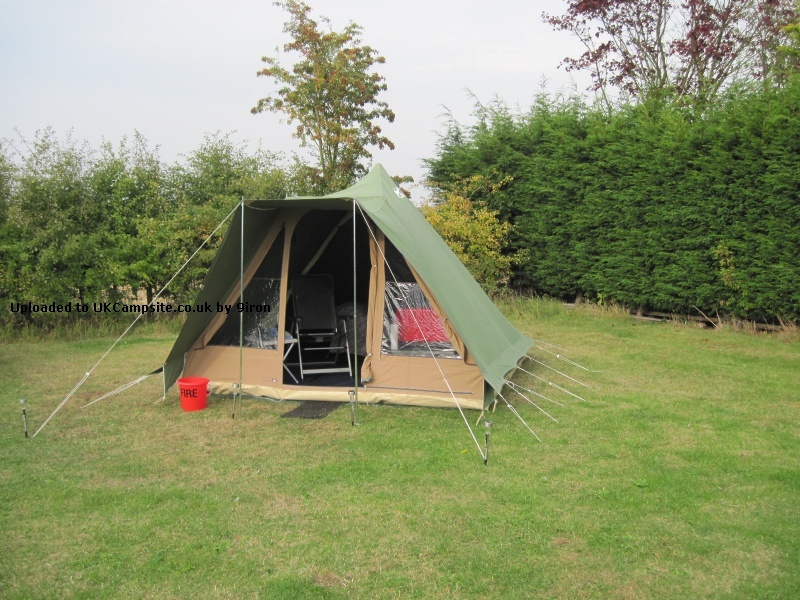 We're a family of three and love the quiet that comes with the Guadaloupe. 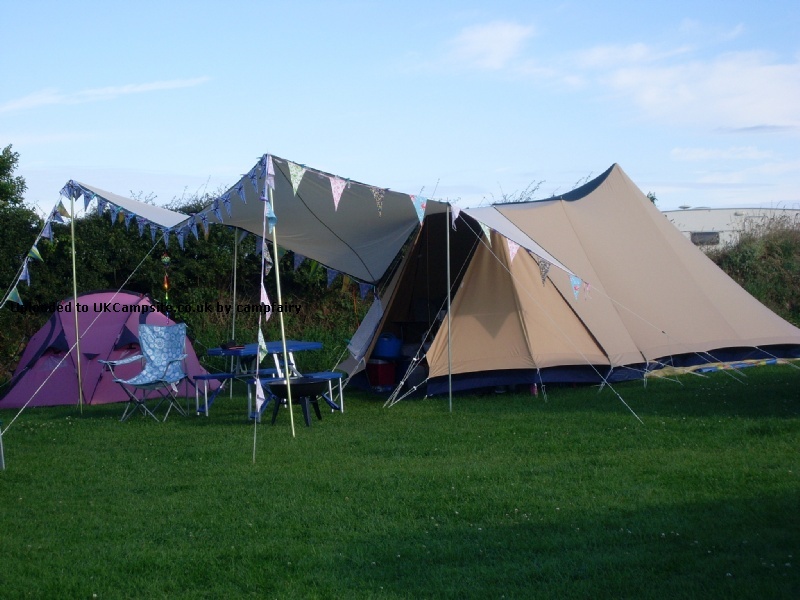 We've just come back from Suffolk where they cancelled the country show due to high winds, but (smugly) we were okay because the tent stands up to all weathers. 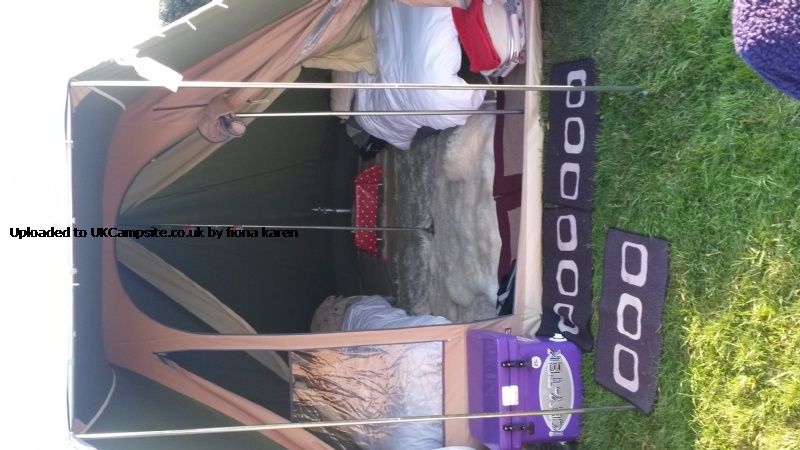 With the inner curtain we can open it and move chairs back into the sleeping area to be cosy in poor weather, or open up the front in hot weather. 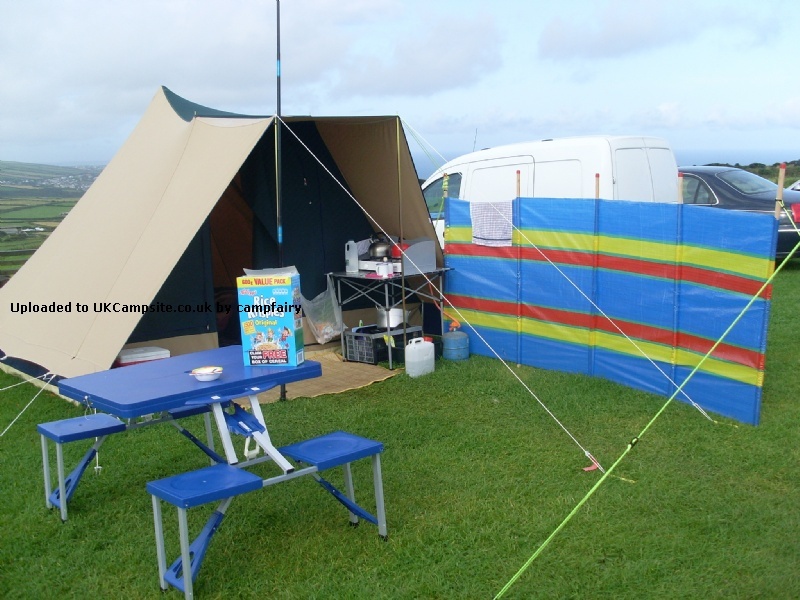 We have one windbreak which we use to make an outside kitchen area and even in the rain I can stay dry when cooking. 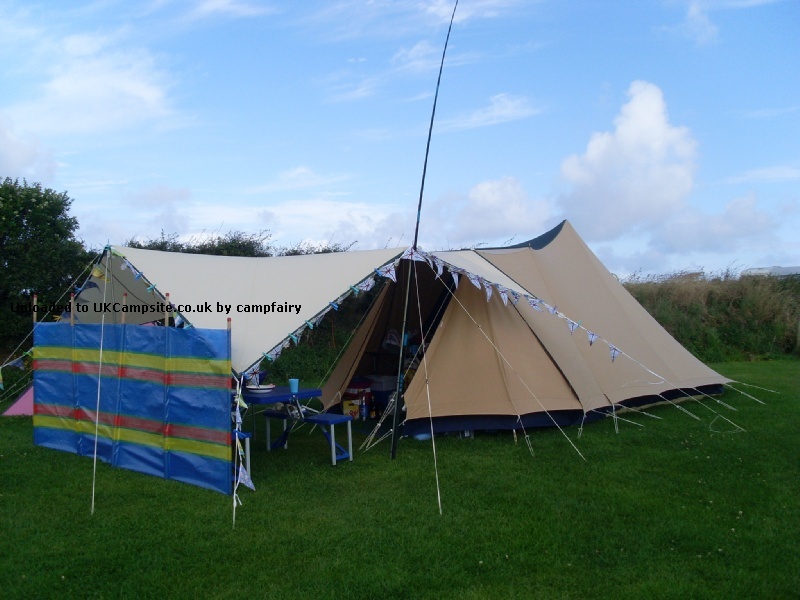 Easy erection, easy living, quiet, comfortable - what more can I say? Looking forward to our second season in the excellent Guadeloupe. 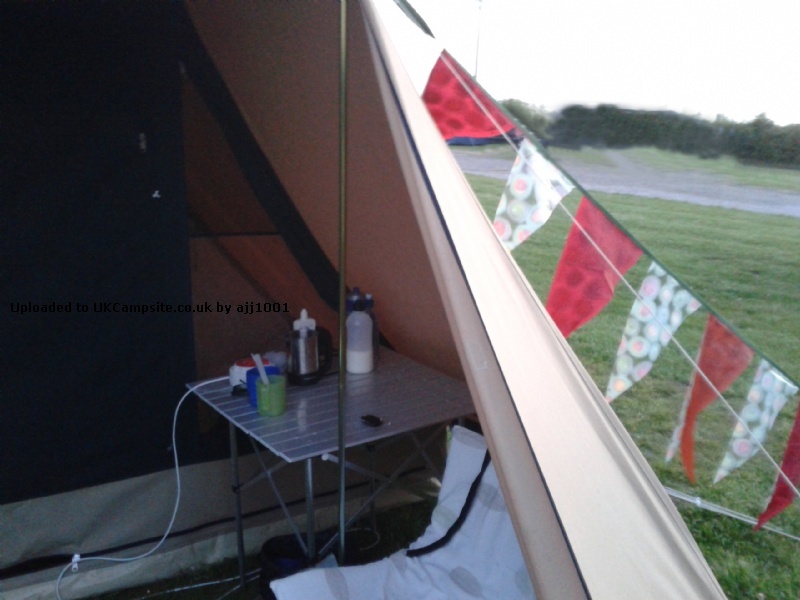 We wanted an easy erect weekend tent as our Cabanon Stratos trailer tent was too much for short stays . 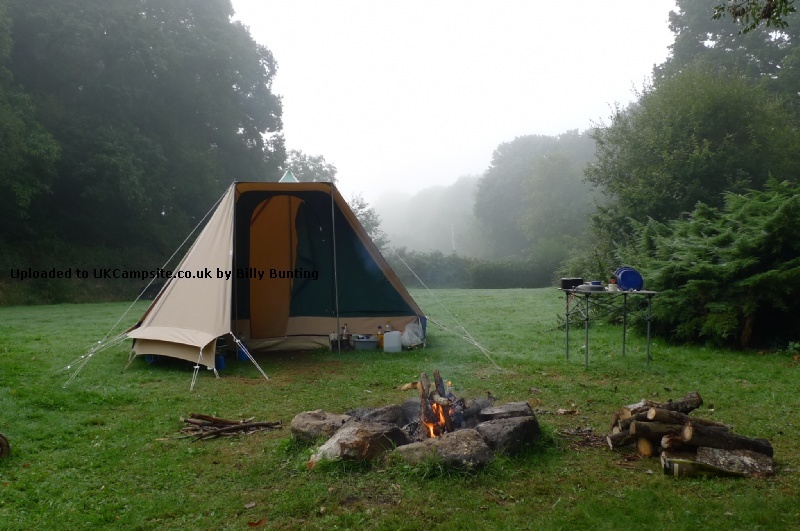 It was a toss up between a Vango Airbeam Infinity 400 and the Guadeloupe and I'm so glad we made the choice we did, especially with some of the negative reviews on the new Vango. 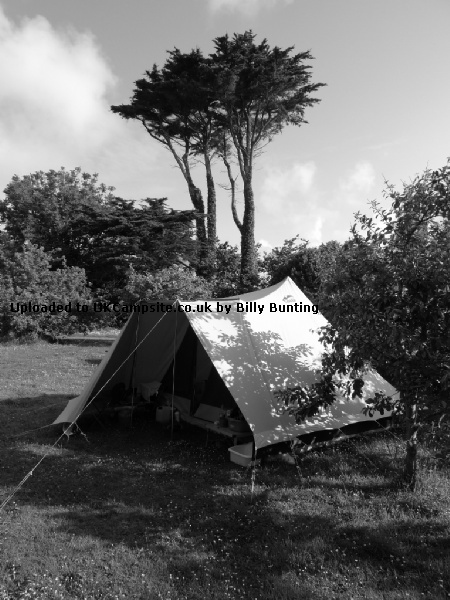 The Cabanon is a simple design and so easy to erect, yet is very stable in bad weather. 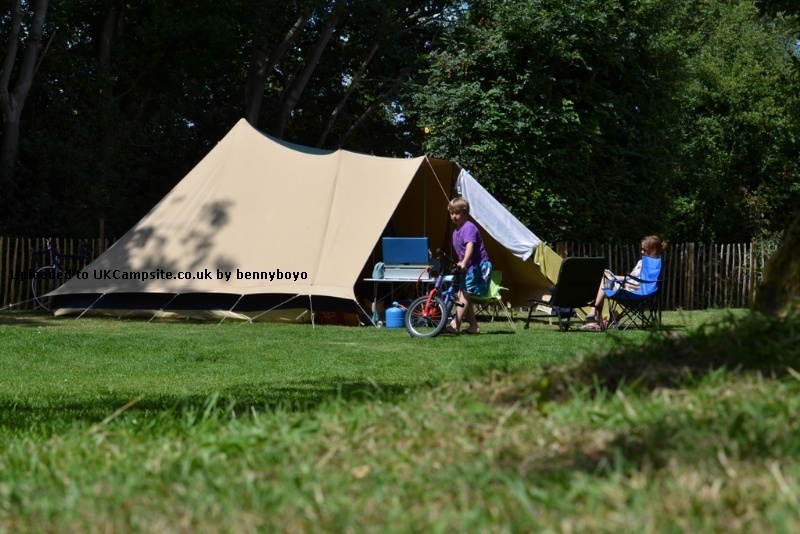 Quality too is superb which is to be expected from Cabanon. 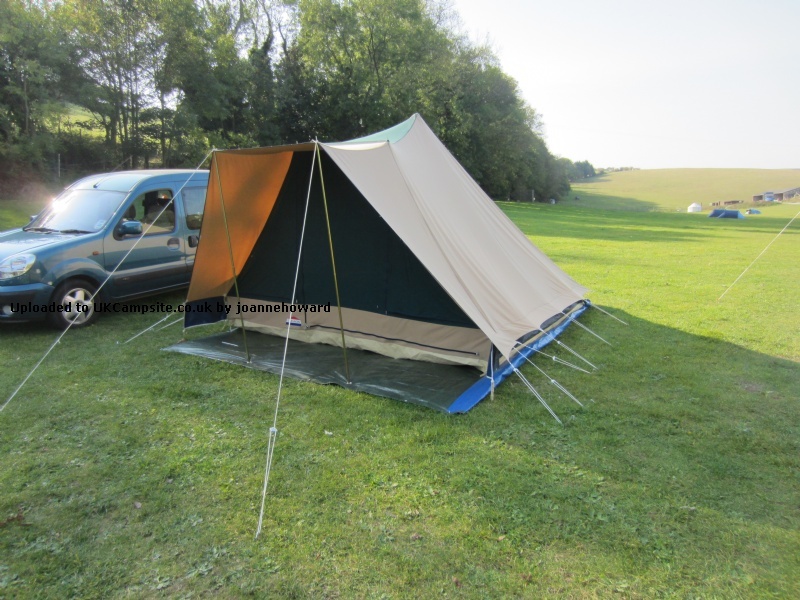 One thing that put us off initially was the fact that it doesn't have an inner tent, it just has a dividing curtain. However, please don't let it put you off because trust me, it won't bother you. We thought it was actually better without one. 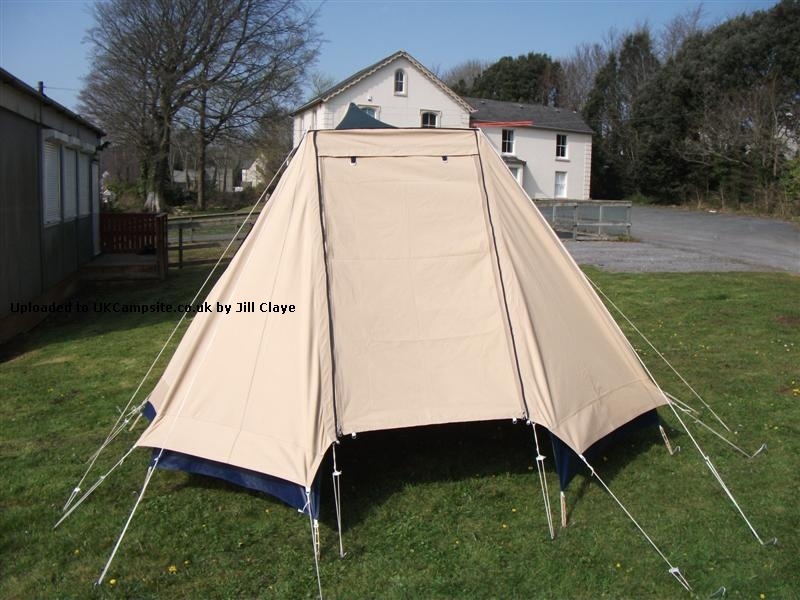 If I could change anything on this tent, I would put some ventilation flaps in the mud walls between the fly and the ground sheet. 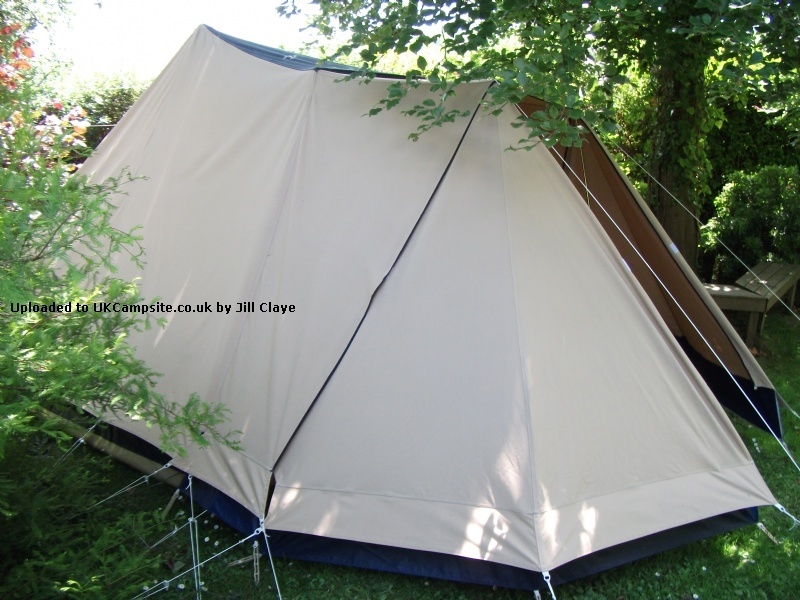 Other than that, this tent is a true classic and it has a 'what camping is all about feel' to it. 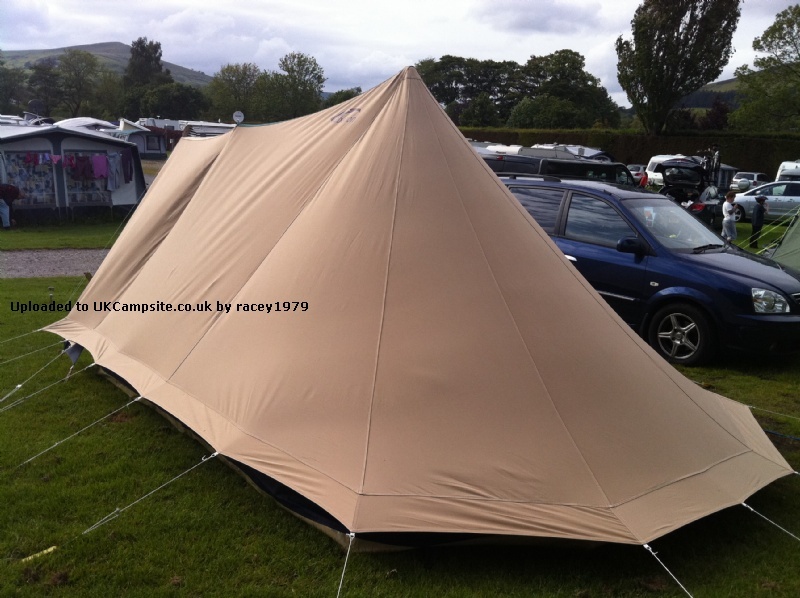 It really is luxury compared to polyester alternatives and much more pleasing on the eye. It's just a shame they keep hiking the price up every year! 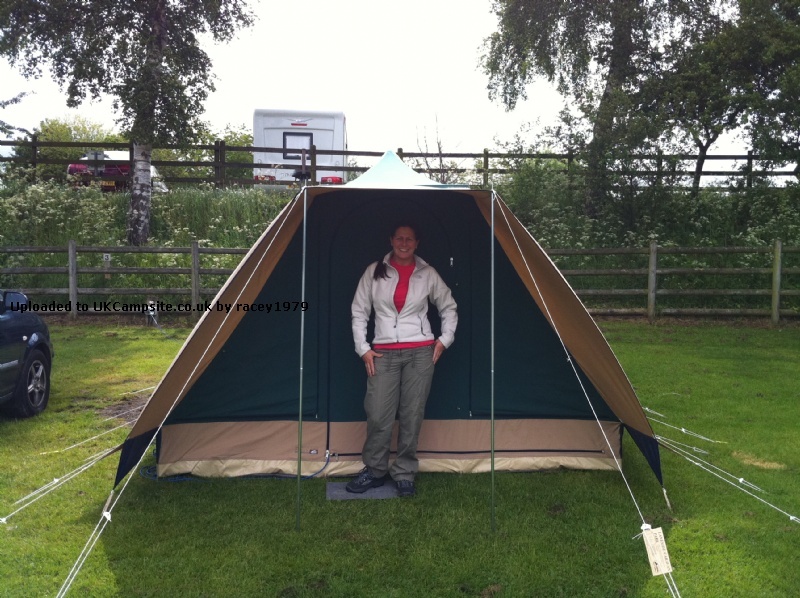 The quality of this tent seems to be great - the stitching strong, the fabric thick and the groundsheet tough. 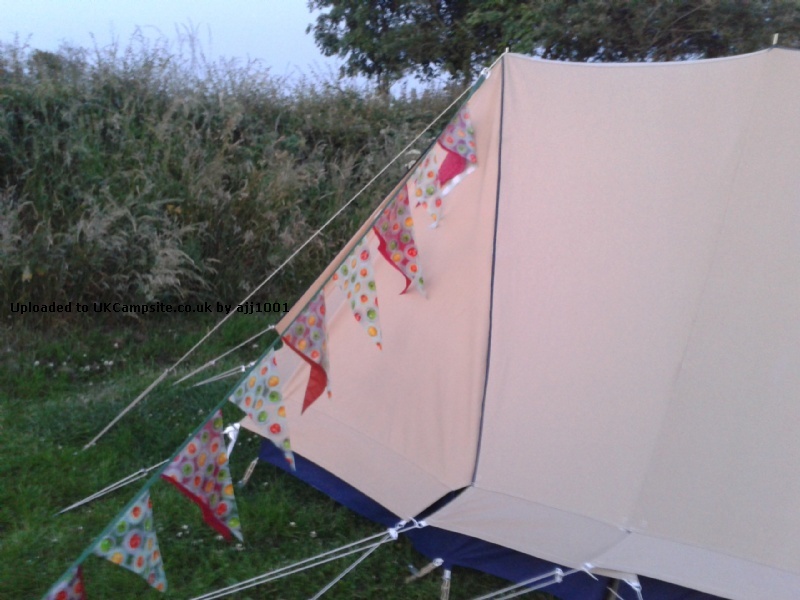 It is really easy to put up, I can manage to do this on my own. 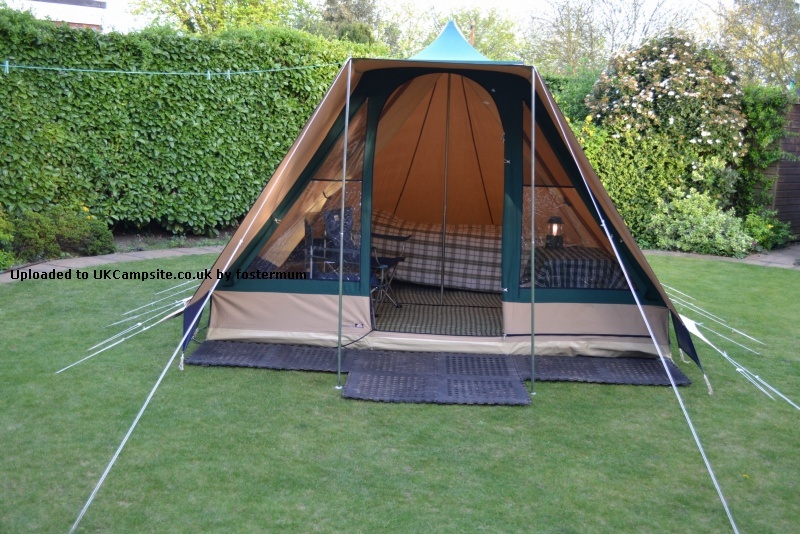 It is a great size for two of us now that my children have moved out (into pup tents) and all of us could squash in for a quick weekend away if necessary. 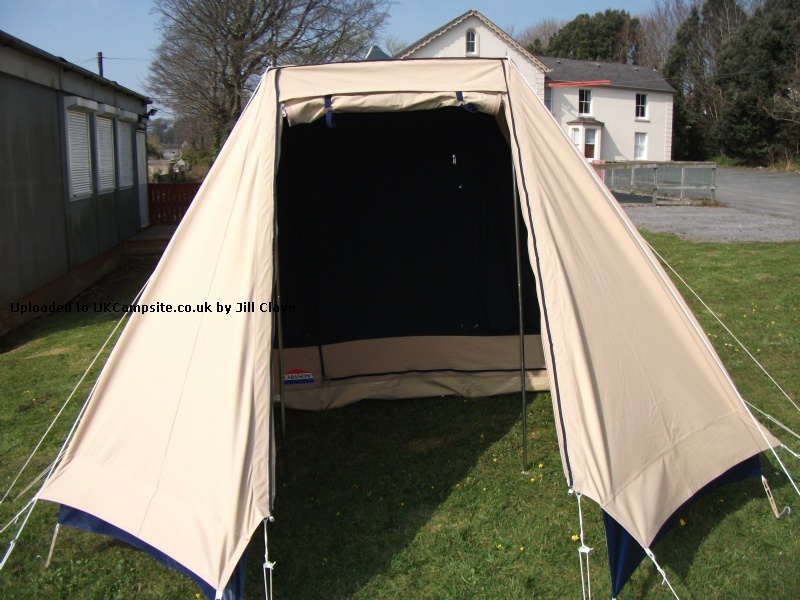 We have the additional side panel and this gives us a bit of sheltered outside space. I like the fact that the canvas means we are cooler in the day time and the smell reminds me of camping when I was little. 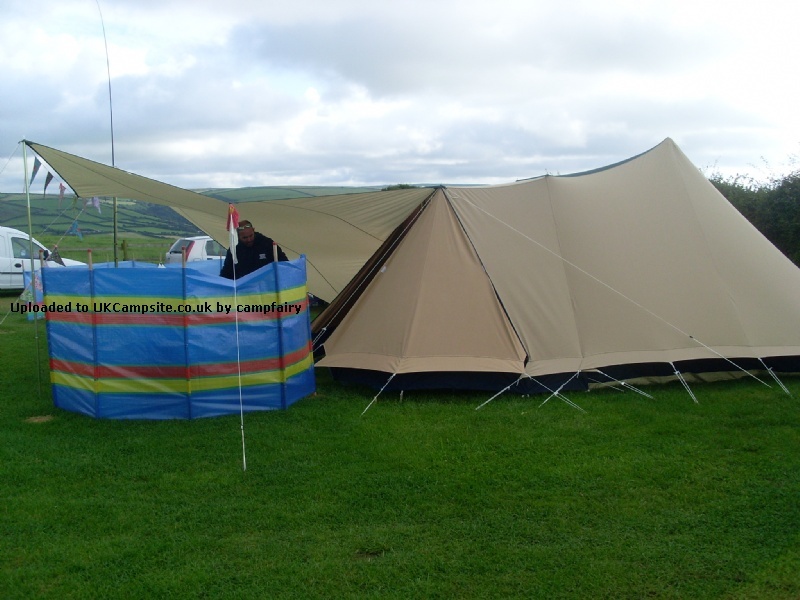 Having used the tent with the two additional windbreaks we felt it would benefit from being enclosed at the front entrance to protect from the elements and to increase the versatility of the space. 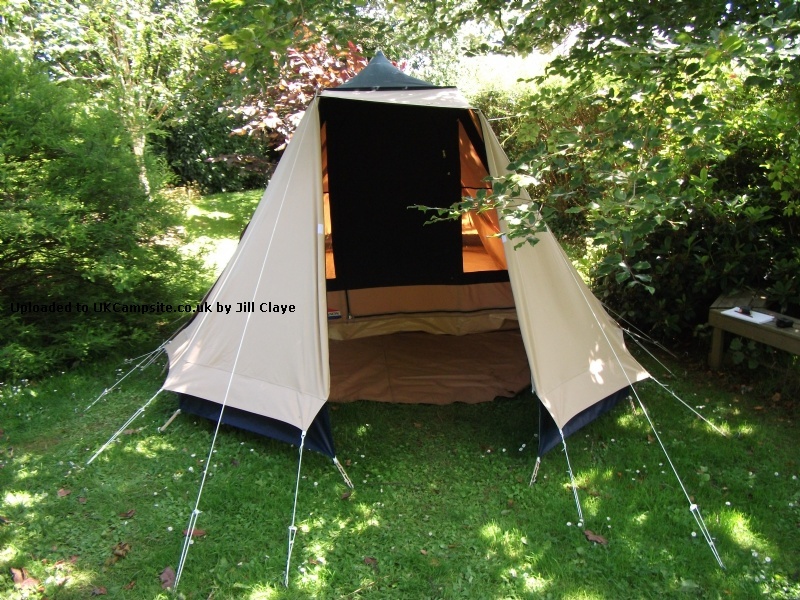 Cabanon told us they have no plans for such an addition so we designed and made one after getting the Guadeloupe fabric from the company we purchased the tent from.The panel is held in place with Velcro and has two zips to allow easy access. I have waited for years to be able to afford one of these and now we have one, and we are not disappointed. 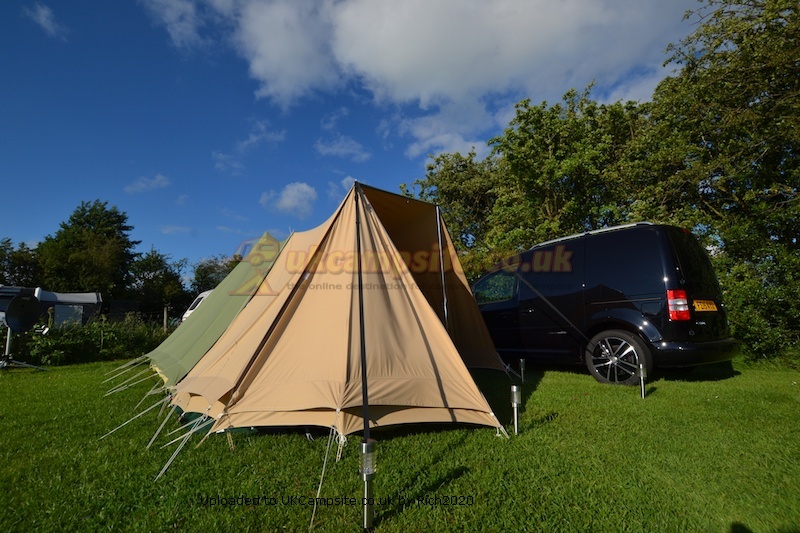 There is just no comparison even to the high quality fibre-glass pole and man-made material flysheet tents we have enjoyed, this is five-star living. The total ease of one-man pitching, the quietness, space, and the inexplicable quality ambience is worth every penny. 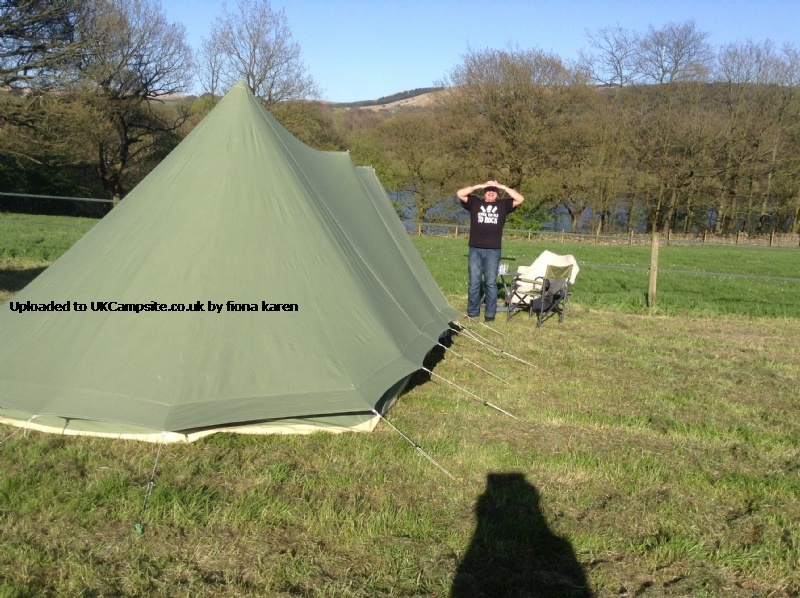 Hopefully with the 20+ year lifespan this is our last tent. 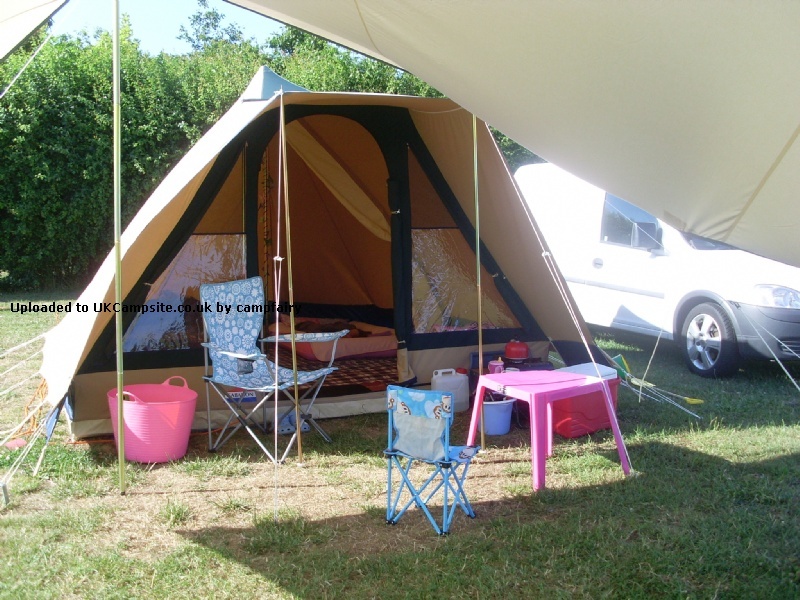 We have only used this tent once so far but it is great. So simple to put up and really stable. The quality is fantastic. 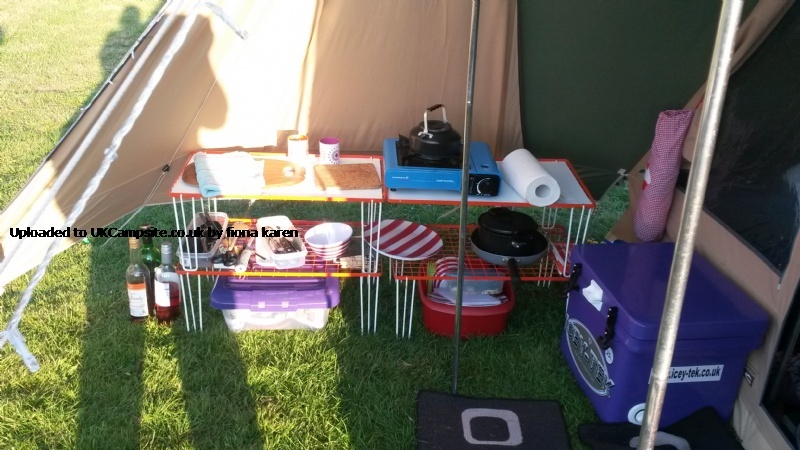 We have a side canopy and used this outside area for cooking. 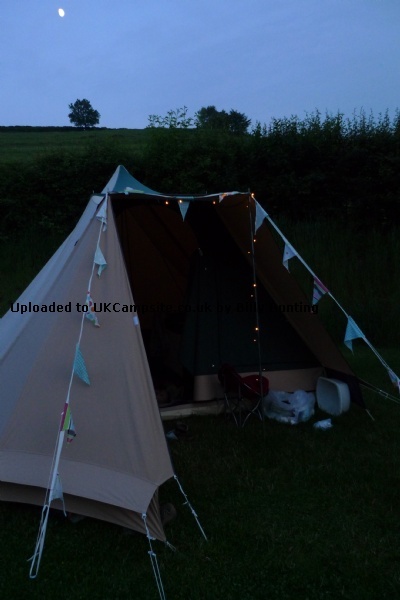 This is much smaller than our previous tent as my children have moved out to their own pup tents now, but for a night or two away I'm sure we would all fit in. 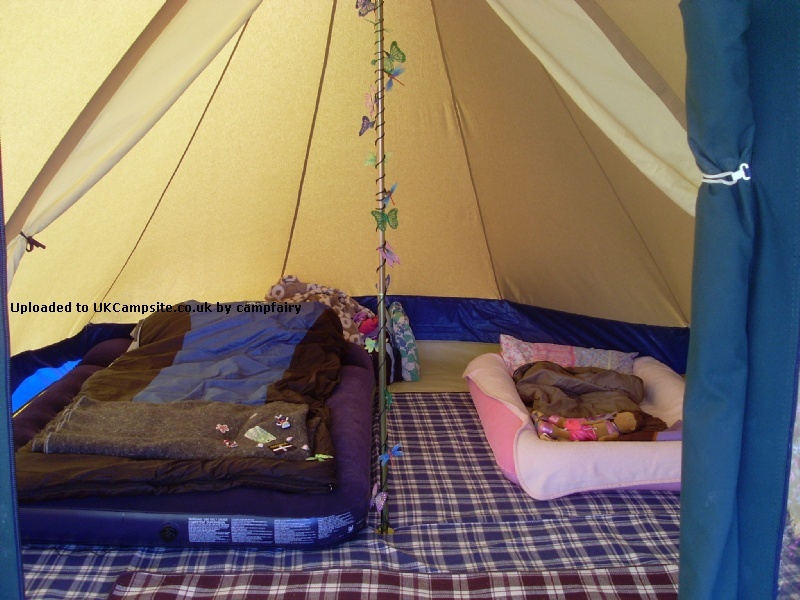 There is no inner tent, just a curtain that separates the living area from the bedroom area. But the advantage of this is that you don't loose any floor space. 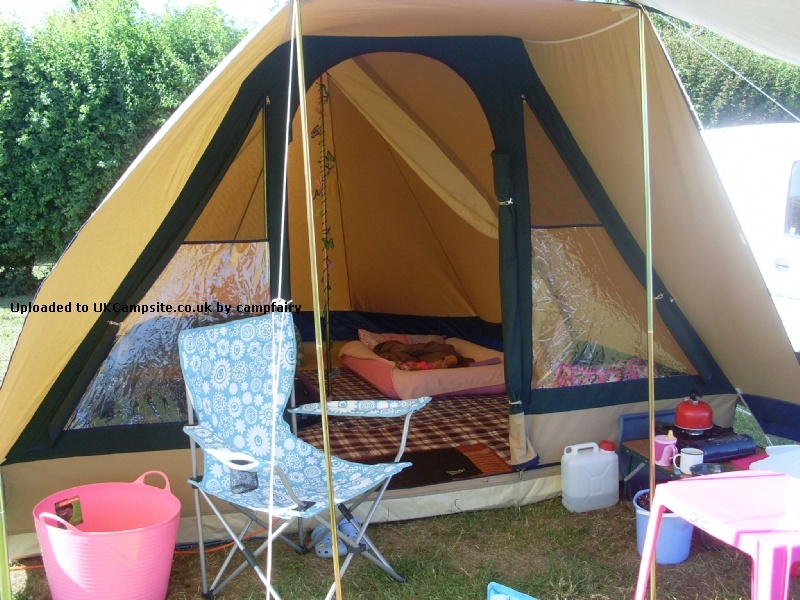 We have just purchased a Cabanon Guadeloupe and pitched it in our garden to rainproof it. 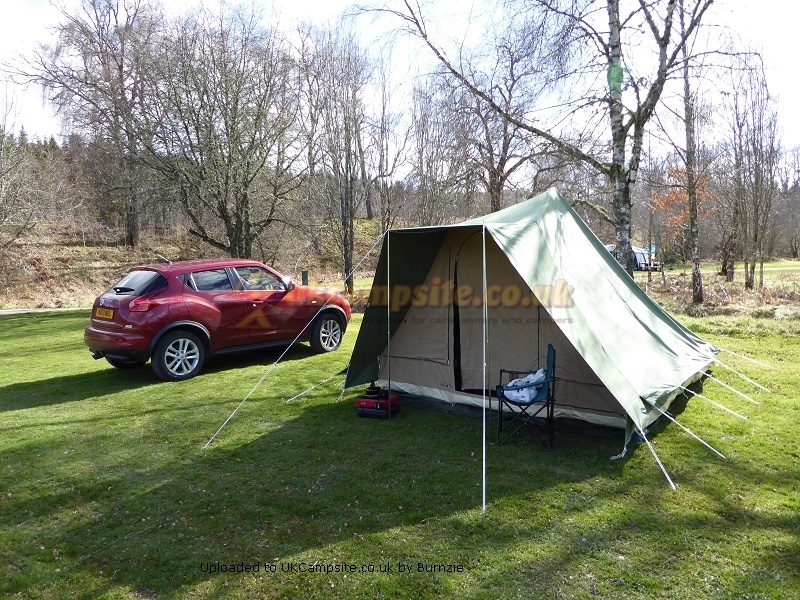 As the photo shows it can be pitched on uneven ground. 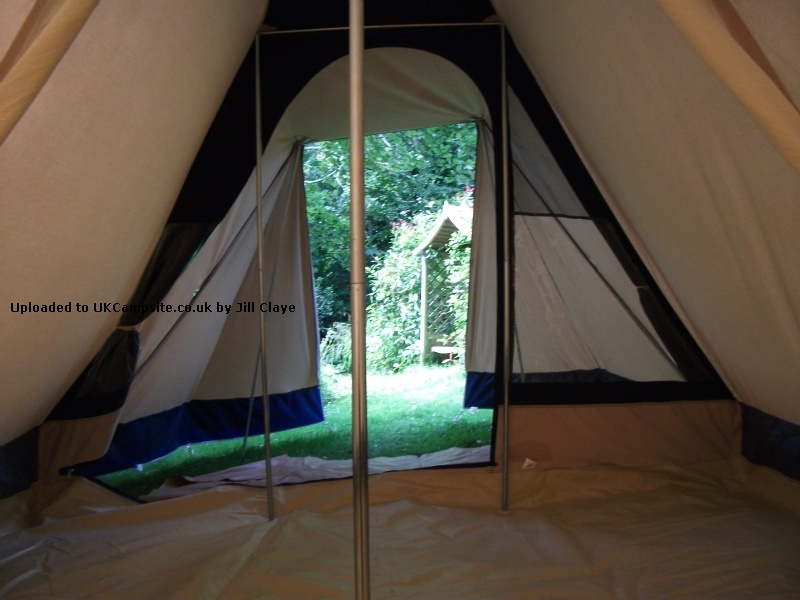 The tent does have external curtains that zip down to prevent wind being blown in through the mesh part of the window. 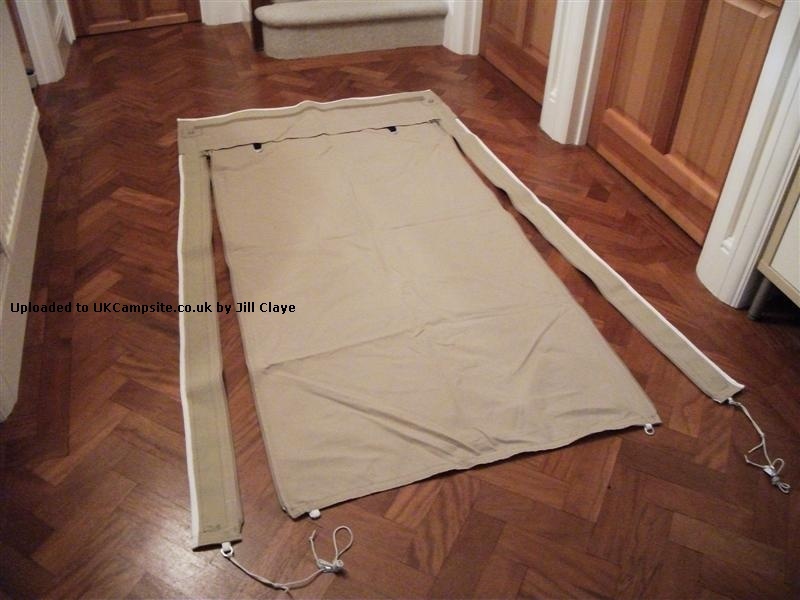 Another feature is a two way door zip to allow the top of the 'J' door to unzipped whilst the side and bottom are closed [good for keeping pets and/or children inside]. 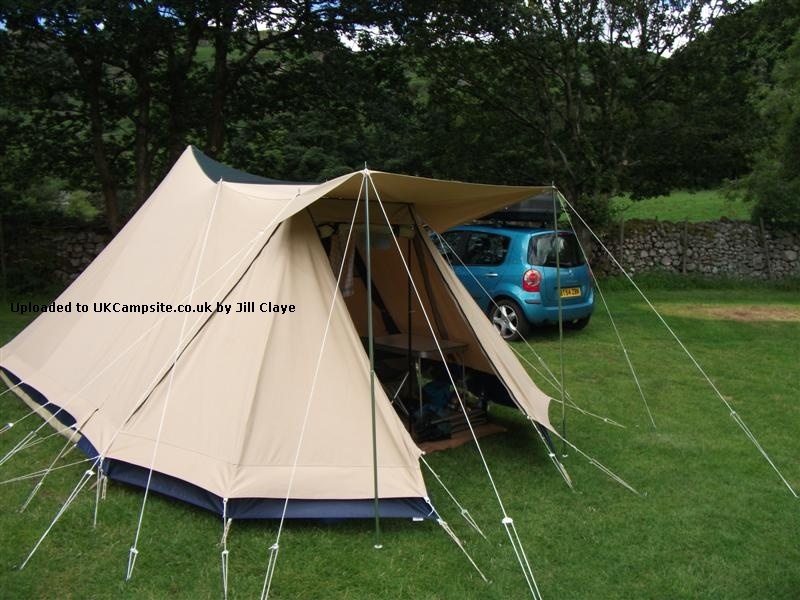 This model does not have an inner tent but does have a zippable and rollback divider, the advantage being the flexibility of sleeping/living space. 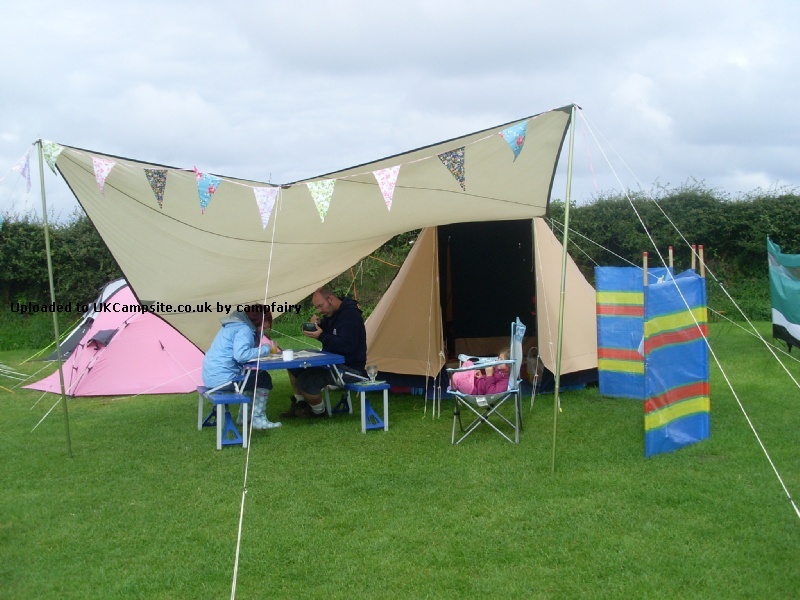 The additional windbreaks [purchased separately] enclose the front of the tent to provide sheltered space under the generous porch, ideal for taking off wet clothes, storage and cooking. 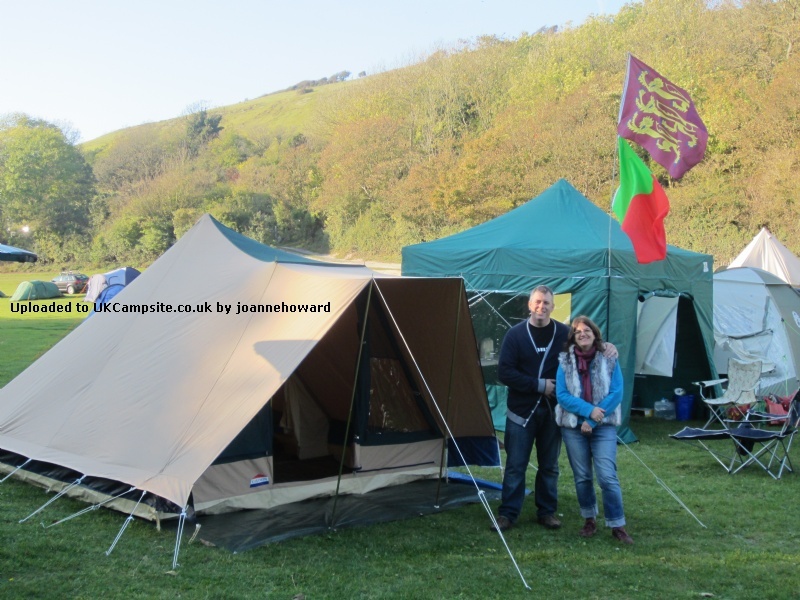 Add your review of the Guadeloupe! 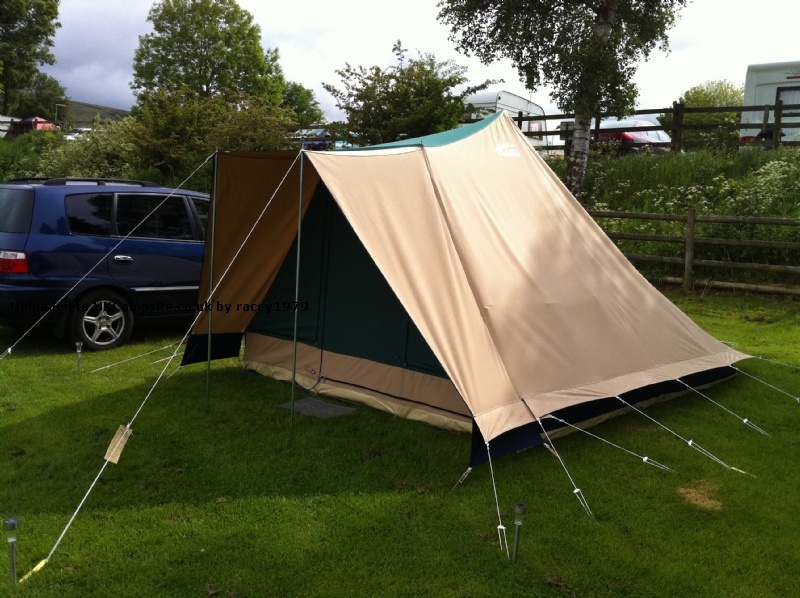 This tent has optimum lightness and ultra-quick assembly thanks to its single skin design and single central pole. 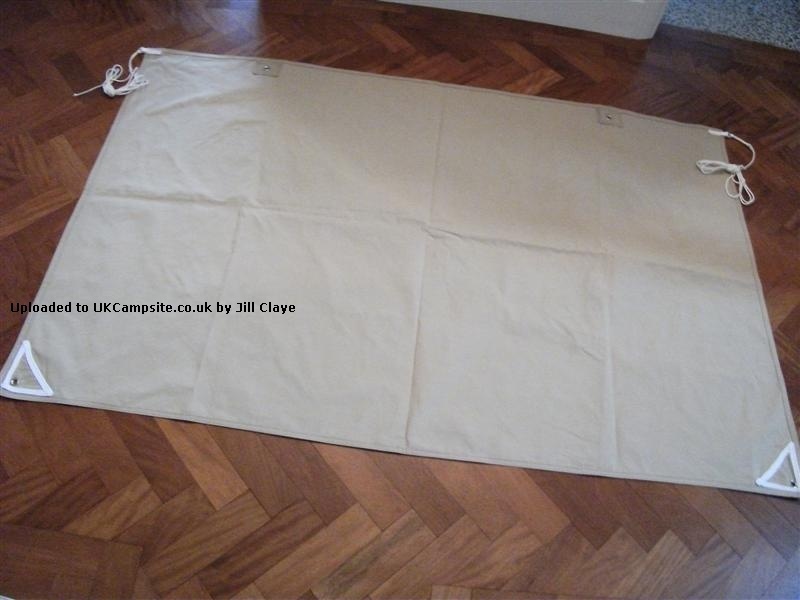 Canvas is 100% waterproof and breathable cotton for optimum protection while allowing moisture to escape. 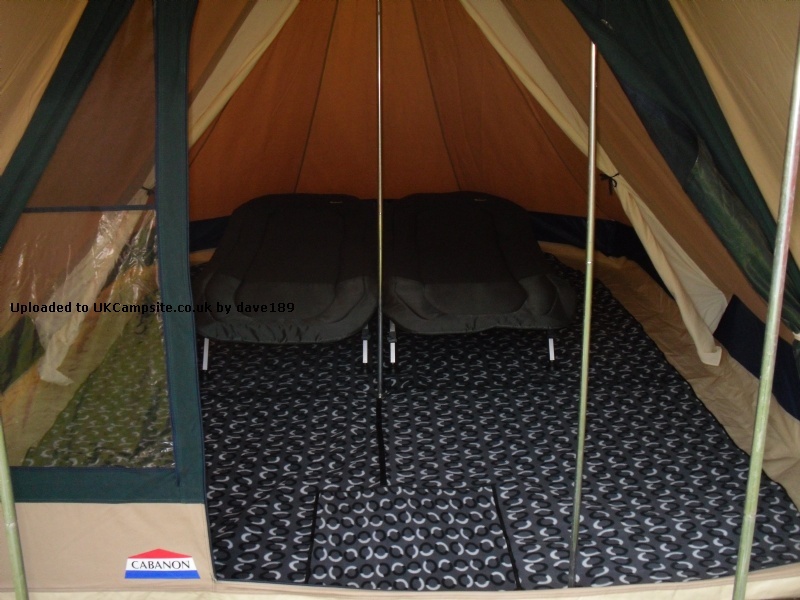 Integral waterproof and tear-proof groundsheet. 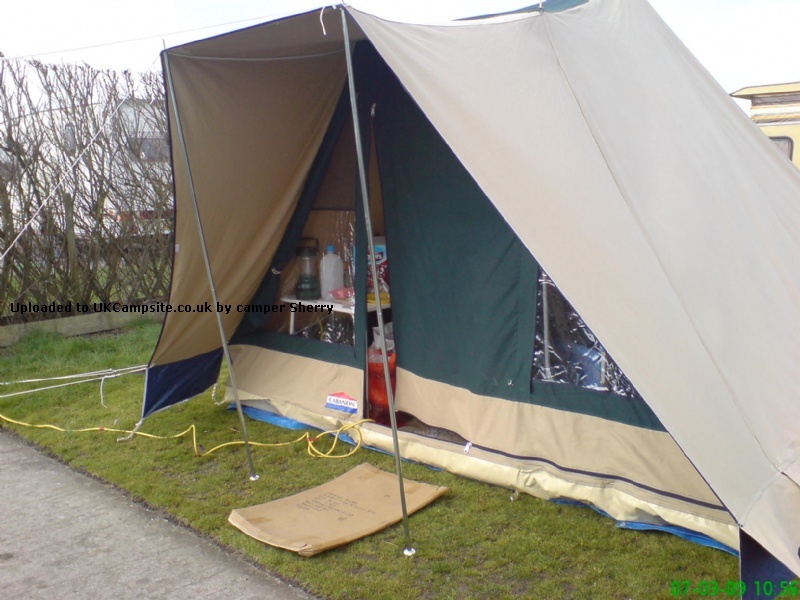 A large central opening which rolls up, and 2 wide side windows with mosquito nets and blinds for good ventilation in the tent. 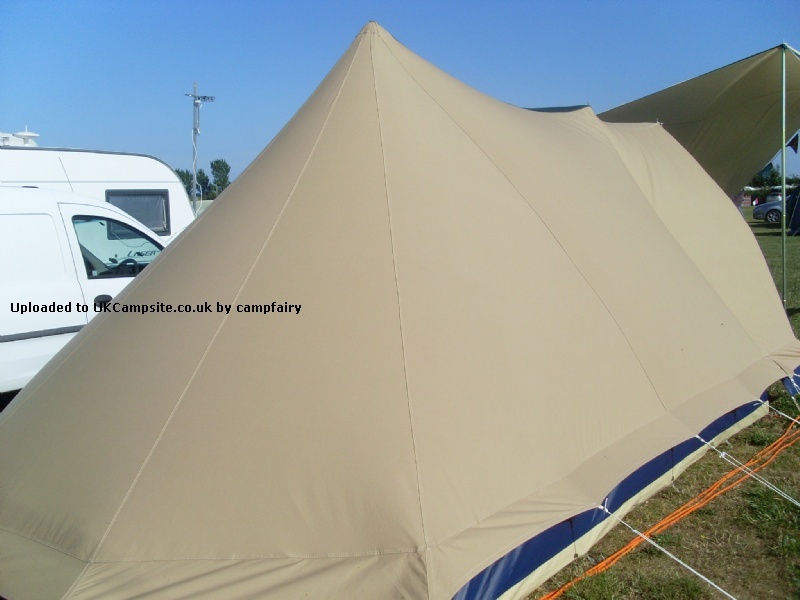 A protective canopy at the front extends the tent space.